Click large image above for a full-size, un-cropped view of images. Windset Farms is one of North America’s premier greenhouse growers, based out of Delta, BC. Windset is known as a leader in designer product labels and bags. This next generation of products needed to continue the clean, slick look that has become synonymous with their premium products. This redesign of Windset Farms’ entire product line was no small task — spanning seven products and 28 sub-brands, there was going to be endless combinations of these products in both English-only and Bilingual versions, and multiple weight/count versions. Redesign considerations included different bag styles (resealable polycarbonate plastic bags, polyethylene bags), net-bag header cards, shipping cases and clamshell labels. All the packaging is designed with premium quality production in mind, and everything must look amazing on the shelf. The old bag design had the label/print area right in the middle of the bag, making it difficult to showcase the product. You can see the new bag design side-by-side with the old bag further down the page. This is the first composite that I made of the new bag design for Fresco® Cocktail Cucumbers, Photoshopping on top of an existing bag that I shot. PUTTING THE SUB-BRANDS FIRST | The idea behind the new package design was to create more shelf presence, with vibrant colours to make the product stand out beside it’s competitors, and to push Windset’s sub-brand awareness front and centre. The other main requirement is to have as much show-through as possible to see the products. All of Windset’s products are assigned a colour, with the sub-brands inside of that family also assigned their own colours; these colours are complimentary to the product inside the package. Product lines like tomatoes have 11 sub-brands, and the peppers have seven, and so a complete family of hues along that master colour have been carefully considered and applied to create a common look. We allow these complimentary colours to shift a few degrees in either direction to differentiate the product families; there’s only so many complimentary colours for green and red produce, which many of their products are. PACKAGE REDESIGN CONCEPTS | I divided the bags into top and bottom fields, so the artwork could ‘slide’ up and down independently to allow maximum product show-through. By having the two artwork areas independent of each other helps the design department immensely once we get into the full roll-out of products because the top and bottom can slide into a comfortable position to contain all the artwork, and showcase the produce inside. 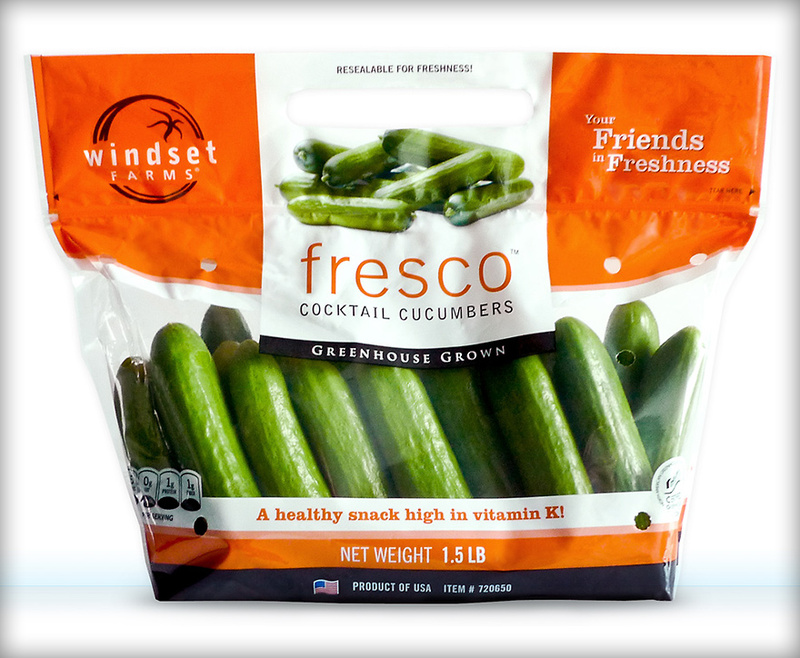 The final Fresco® Cocktail Cucumbers bag sample; shot for a press release to launch the new bag designs. The top dual-scoop design holds the key graphics in place, allowing the sub-brand area to be brought to the top; front and centre. This allows for optimum visibility on the shelf — think magazine cover. The graphics and information on the top of the bag are kept to a minimum to keep it clean and slick, the other information lives together in the bottom field. Secondary information such as the weight/count and country of origin are all together, and the introduction of retail-friendly health claims (backed up by nutritional information on the back of the bag) and nutritional barrels help consumers make quick and informed healthy decisions when grocery shopping. The thick white stripes bookend the produce on the top and bottom of this design for maximum pop of the product against it’s complementing colour, and the rich black base of every bag reinforces that strong pop of colour, and finishing off the bottom of the bag where it won’t always sit up perfectly. POLYCARBONATE RESEALABLE BAGS | The resealable bags with built-in handles were the most commonly style of bag used for everything from cucumbers, tomatoes, some of the bell pepper and lettuce products. These bags are on a slightly thicker, more rigid plastic and have a premium printing quality which make photos and text very crisp and legible; even printing country of origin flags very small maintain their legibility. The new bag design on the left has more shelf presence, more vibrant complementary colours to make the produce stand out, and the ‘fresco’ sub-brand is brought up to the top front and centre. The introduction of health claims and nutrition barrels are also more retail-friendly components of the new design. 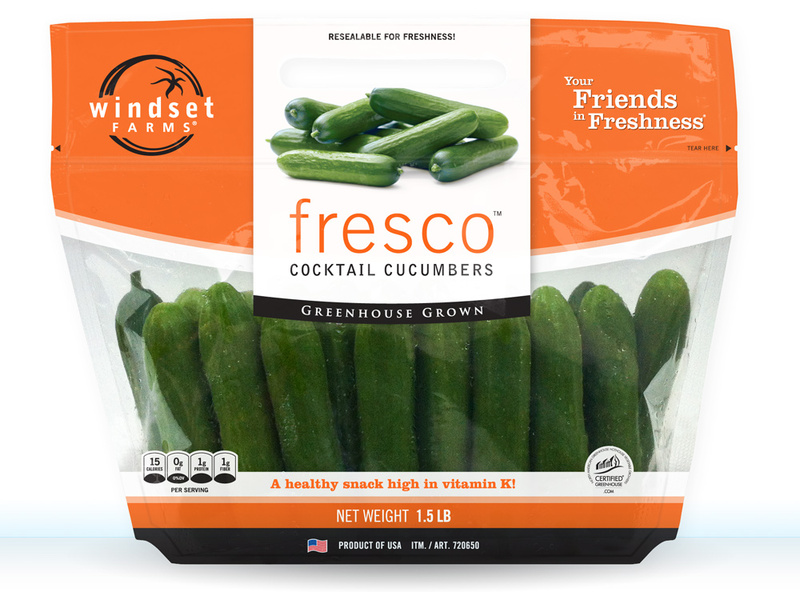 The Fresco Cocktail Cucumbers bag was designed first, with the Concerto Grape Tomatoes following immediately after. Without all treatments established, we moved forward on this tomatoes bag and a couple of other ones to test how they’d work. Fresco Cocktail Cucumber bilingual bag for sale in Canada, showing the front and back of the bags. The back of the bags have lots of room for marketing messages as needed, as well as a recipe photo; an extension of Windset’s Friends in Freshness program that drives traffic to their website where hundreds of premium quality recipes with easy to follow along steps and video presentations reside. 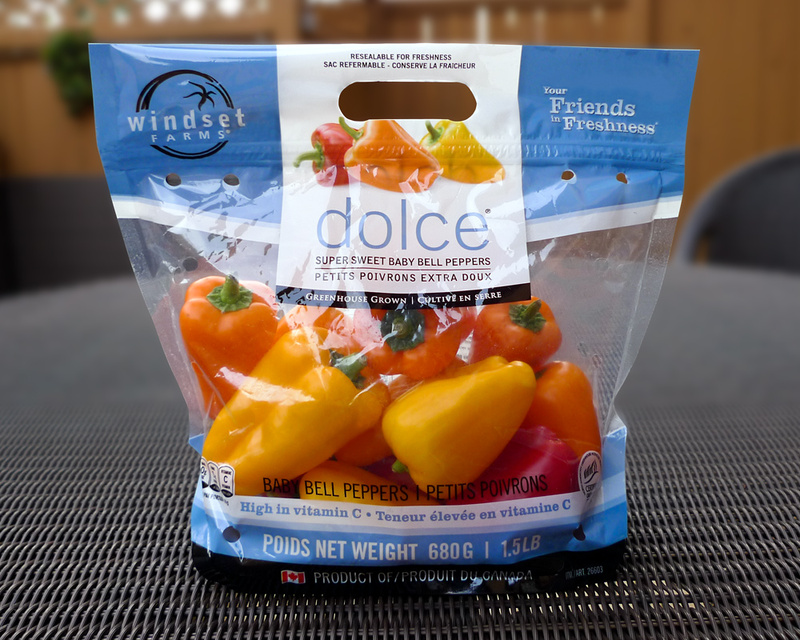 Windset wanted to ensure that every product package is CFIA compliant for food labeling and nutritional claims. I was responsible for ensuring the new packages are compliant, and that they stay intact as we worked through the roll-out the dozens of bags, labels, etc. POLYETHYLENE BAGS | Many of the new designs were also applied to polyethylene bags, which are very common in much of the food packaging on grocery store shelves today. The print quality of these bags do vary; sometimes the registration holds up perfectly, but it’s also common to see your artwork shifting more than 1/16″ which can reek havoc on your design. 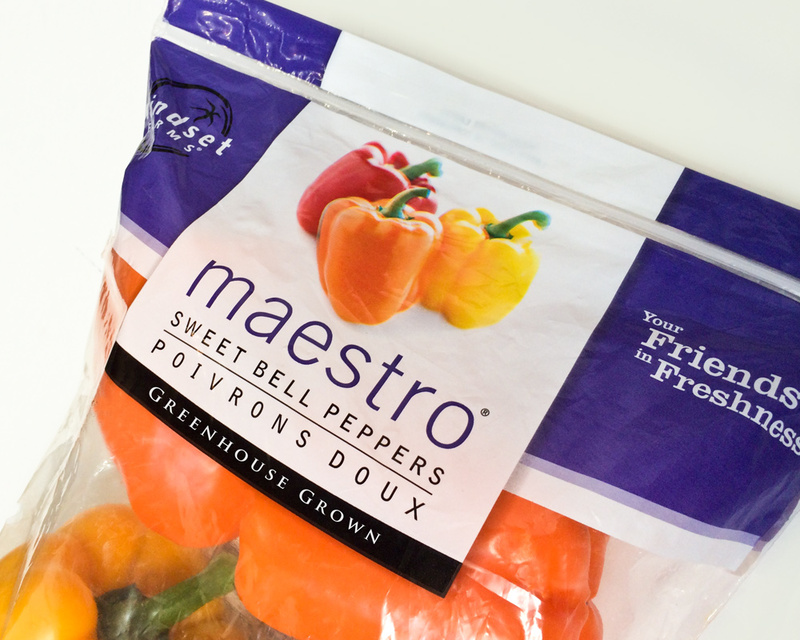 Detail photo of the top of a Maestro Sweet Bell Peppers bag. 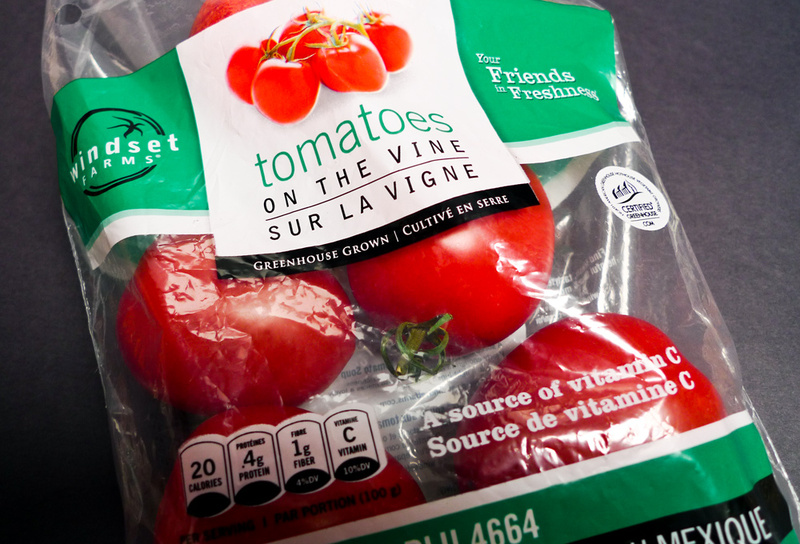 Detail photo of the front of the Tomatoes on the Vine polyethylene bag. The new Windset Tomatoes on the Vine poly bag design on the left, and the old design on the right. Tomatoes on the Vine polyethylene bag incorporates a very similar design for the front and back, but had to be customized to fit the bag which tapers from top to bottom. NET-BAG HEADER CARDS | A few of the Tomato on the Vine products are shipped in net-bags, with card headers that are affixed to the top of the bag. The same scoop design is applied front and back of this smaller, longer format; paired down to the minimum elements to fit in the limited space. 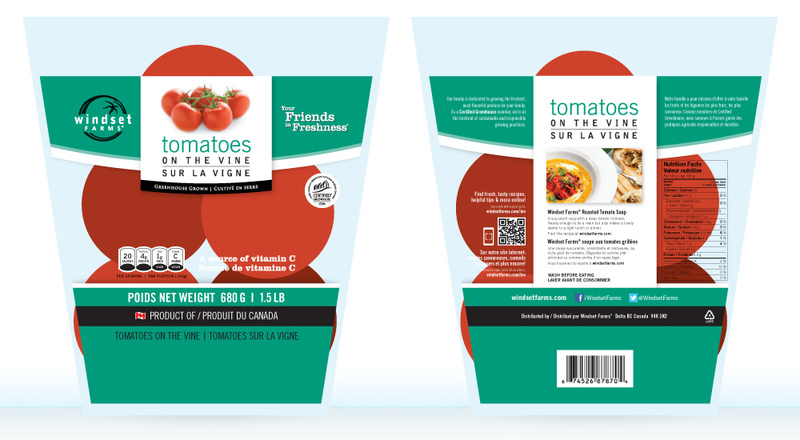 Front and back of the header card for the Cameo Cherry Tomatoes net-bag incorporates the same design as the plastic bags, made to fit the much smaller, longer format of the head card. On the right, I’ve mocked up the new header card design onto an existing photo of the net-bag. CLAMSHELL LABELS | Many of Windset’s products are shipped in custom clamshells with a label. The labels come in many sizes and configurations, so creating a design that works is no easy feat. The new design for the labels incorporates many elements on it such as the new Non-GMO certification graphic in addition to the required legal text. This new label design incorporates the same top/bottom concept, with the matching scoop appearance at the top, again pushing all the important branding info up into the top half of the label. This allows the secondary information like the weight/count, country of origin, UPC code, etc. to reside in the bottom half of the label. 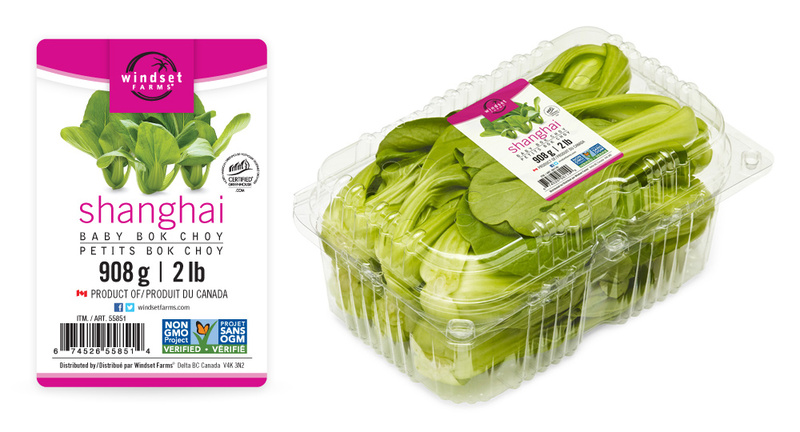 The Shanghai Baby Bok Choy label maintains a consistent design across Windset’s entire product line. Here’s the label by itself, and on the 2lb clamshell. DISCLOSURE | While I did design and produce almost all of the Windset Farms packaging shown here, I did not design it alone. I did the initial concepts and design of the resealable handle bags, and developed the concept of the moveable top and bottom scoop elements which would help us significantly as we roll out the bag applications once finalized. 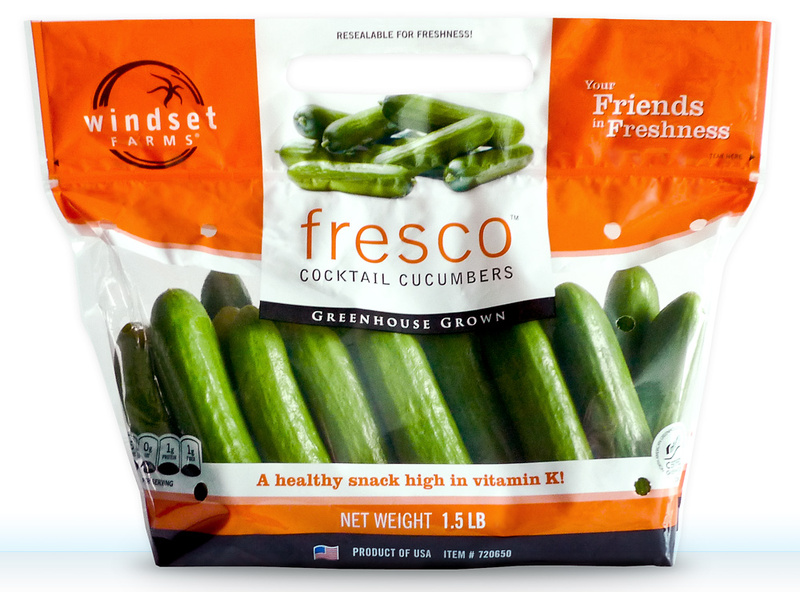 I was well into finalizing the design of the front of the concept bag (Fresco® Cocktail Cucumbers) when the project was literally flipped on it’s end; the colour scheme of the produce categories were inverted to complementary colours and the bag artwork inverted to how you see it here. Which is how it was originally designed to be anyway; initial explorations not shown to the client have the bags laid out as we see them today with all the branding work floating to the top of the bag. I was responsible for ensuring the text was CFIA compliant for Canada, and legals specs were followed for sale in the United States, Mexico and Japan. I was also tasked with overseeing that the text stay compliant and to ensure consistency throughout the production roll-out of Windset’s complete product line, which produced more than 30 bags, dozens of cases, vinyl bags, clamshell labels, and net bag headers. At Tugboat Group, the design department works closely with each other, and design work on projects of this scope overlap each other, so I want to be clear that while I’m confident in claiming these design as my own, there was countless design changes to the back of the bag (once the front was finalized), and the roll-out of the full product line was worked on by the creative department for months. As the roll-out of the bags were underway, I continued updating the new design to the polyethylene tomato bags, clamshell labels and net-bag header cards to our new look and colour scheme. See also Windset Farms Office Environmental and Wayfinding Design and updates to Windset’s website including the WindsetTV page. Work completed while employed as a Senior Graphic Designer at Tugboat Group. All work copyright Tugboat Group, Windset Farms, and their respective owners.